The exhibition is based on interviews with people who migrated to this area. We listened to stories about their sense of self in relation to the world they came from and the new world they’ve constructed for themselves in Iceland. The title refers to the idea that immigration is a mutual cultural exchange where diversity is accepted and welcomed, where everyone has the opportunity to learn something new from one another and enrich the community. Whether or not people are Icelandic, and in whatever way they may identify, there is room for them in Icelandic society as they are and as they choose to be. Our guests are invited to shine a spotlight on these individuals, their perceptions, and their unique experiences by taking a peek into the boxes to let their stories come out. It’s a wall of shoes with headphones for people to listen to stories shared by their owners of different age groups. You will find yourself giggling quietly at a pair of ordinary looking high heels and your breath will be taken away by old fashioned rain shoes from the last century. Everyday objects the simplest and most used hold incredible stories. 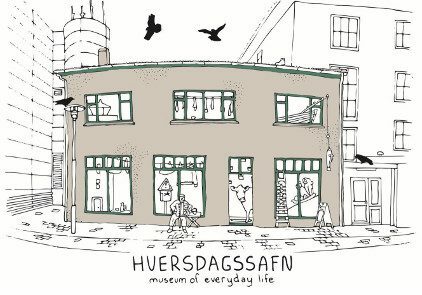 The exhibition “Various Things Happen” was installed in the summer of 2016 and consists of stories and photographs grafted into old, hardbound books that were given to the Museum of Everyday Life after a book clearing at the public library in Ísafjörður. The title of the exhibition alludes to typical stories told around the kitchen table in conversations about everything and nothing. The stories were obtained by participants who showed their family photo albums and shared memories connected to the pictures.